The range of Skywatcher telescopes are a good starting point for amateur astronomers, from the inquisitive beginner, to the seasoned stargazer who requires more highly developed optics and imaging platforms. 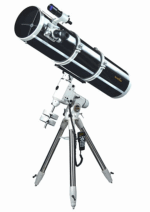 If you look through Skywatchers range of products, you will soon discover they offer an amazing choice of top quality astronomical telescopes and accessories, that are suitable for users of all ages and abilities. Combined with modern optical technology and precision mechanical engineering resulting in designs of superb functionality, versatility and uncompromising levels of performance. Optics are as you would expect of the finest quality, and are suitable for a wide range of observing applications, from the 50mm spotting scopes up to 150mm (6") refractors, 200mm (8") reflectors, and 250mm (10") Dobsonians. As with all Skywatcher telescopes you should ensure they are balanced before each observing session because doing so minimizes stress on the telescope mount and makes it possible for precise control for micro-adjustment. This is especially relevant when using the optional clock drive for astrophotography. Which Skywatcher Telescope Do You Use? Skywatcher scopes have received rave reviews and recommendations from leading astronomy magazines, and we believe that whatever your interest, terrestrial or celestial, there is a Skywatcher that will more than likely exceed all your expectations. The quickest way to find objects is to learn the Constellations and use the finderscope, but if the object is too faint you may want to use the setting circles. This enables you to locate celestial objects whose celestial co-ordinates have been determined from star charts. Your telescope must be polar aligned and the R.A.settingcircle must be calibrated before using the setting circles. Tube Rings make for easy installation of the optical tube and can be loosened during use to allow for tube Rotation and balancing. Skyliner DobsonianThe Skywatcher Skyliner Dobsonian telescope is a long time favorite of countless amateur astronomers. These high-end telescopes all feature a doublet objective lens. One element is made from premium Japanese Ohara FPL-53 Extra-Low Dispersion (ED) glass, which virtually eliminates chromatic aberration. In spite of their modest dimensions they still pack a powerful punch. Their High-Resolution optical systems are multi-coated to maximize contrast and image sharpness. Regardless of whether your requirement is for terrestrial or astronomical use, this compact telescope is ideal for the first time buyer. The Equinox 100 is an excellent mid-level ED refractor that is capable of excellent astrophotography and is capable of superb planetary views. For astrophotography, this model features an f/7.5 focal ratio – more than speedy enough for today’s sensitive CCDs and digital SLR cameras. This scope is a superb option for anyone looking to upgrade from a beginner's scope. A Dual-Speed 10:1 ratio focuser is now included for excellent focusing precision. This new Skywatcher Newtonian Reflector incorporates the same superb mirror-set as the Explorer-150P Black Diamond Series. The tube length has been slightly shortened on this model to optimise performance for prime-focus photography. This very large aperture high quality parabolic reflector Telescope will provide stunning views of Solar system objects along with Galaxies, Nebulae and clusters.